Thief River Falls players celebrate the third-place victory over Hibbing/Chisholm, the Prowlers first tournament hardware since 1959 (Photo by Helen Nelson). Josh Koop (31) posted an 18-save shutout in the Class A third-place game Saturday morning at the Xcel Energy Center (Photo by Helen Nelson). Josh Koop had been on the bench for the first five games of Thief River Falls’ run to the Class A state tournament. So when the Prowlers’ senior goaltender got the nod to start what is sometimes a sluggish third-place game early Saturday morning, he knew he had to provide energy. No caffeine boost could have done it better. “This is everything,” gushed Koop after he posted an 18-save shutout to lead the Prowlers past Hibbing/Chisholm, 3-0 at the Xcel Energy Center in St. Paul. Junior Riley Soderstrom scored twice in the second period to break open a scoreless game and Koop made the lead stand up. Austin Odberg also scored with 1 minute, 46 seconds remaining, his first goal of the playoffs. Before taking the ice Saturday morning, Koop received a few important words of advice from two of the best goaltenders to ever play in the northwest corner of Minnesota – Roseau’s Jake Brandt and Thief River Falls’ Zane Gothberg, Frank Brimsek Award winners as the state’s best senior goalies in 2000 and 2010, respectively. Brandt, who led the Rams to the 2000 state title, is one of Koop’s goalie coaches – and had a bit of advice about staying focused between the pipes. “He always told me to prepare like you’re playing every game and I took that to heart,” said Koop, who didn’t learn he was starting until late Friday night when coach Tim Bergland gave the senior the nod in the team hotel. He had been the backup to junior Jon Narverud through the first five playoff games. Koop finished his senior season with a 10-4-0 record in 16 games with a 2.10 goals against and .901 save percentage. Saturday’s shutout was his second of the season (he also blanked Hutchinson on Dec. 30, making 18 saves). 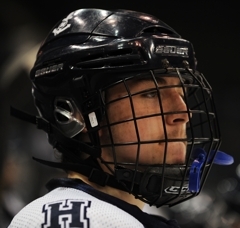 He’s played sparingly over the past month, as Narverud grabbed the starting spot. The two had battled throughout the season to replace Gothberg, arguably the best goaltender to play for the Prowlers. “It motivated us last summer to work hard and get better because the expectations were so high,” said Koop. 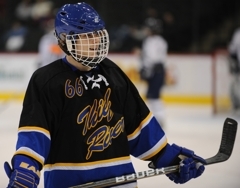 Gothberg, now playing with the USHL’s Fargo Force, continued to follow the Prowlers through the state tournament this winter. He sent out an inspirational text message to his former Prowlers’ teammates before each of the first two games. “He told us that it was our game,” said Koop. Koop credited much of his success to his defense, which allowed Hibbing/Chisholm just 18 shots on net and held star sophomore Adam Johnson off the board. 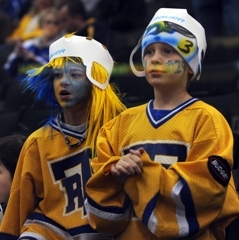 Perhaps these young Prowlers fans will one day add to the trophy case at Ralph Engelstad Arena (Photo by Helen Nelson). Ralph Engelstad Arena in Thief River Falls is more stick-and-puck palace than hockey rink. The $15 million “Little Ralph” includes a section devoted to its main tenant, the town’s tradition-rich high school team. Memorabilia from the Prowlers 1950s heydays (they went to the state tournament six times that decade, winning titles in 1954 and 1956) is prominently displayed along a “wall of fame” alcove off the main lobby. A bronze sculpture of Engelstad welcomes visitors to the shrine to Thief River Falls hockey. “You see all those trophies, and you just want to get there,” Thief River Falls senior goaltender Josh Koop said on Saturday, March 12, after the Prowlers earned some hardware that will be added to the rink’s collection with a 3-0 triumph over Hibbing/Chisholm in the state Class 1A third-place game at the Xcel Energy Center in St. Paul. “And then, really, when you get here you just want to soak it in. It’s pretty special now. Prowlers coach Tim Bergland is a Thief River Falls native who is well-schooled in the town’s hockey tradition. He was a Prowlers standout in the early 1980s and went on to play at the University of Minnesota and in the NHL. Fully motivated to expand their trophy case, Thief River Falls got an 18-save shutout from Koop and two goals from junior Riley Soderstrom as it finished a state tournament with a win for the first time since 1959, when it took the consolation title. 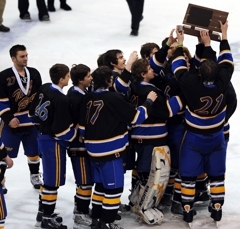 The Prowlers, who finished the season 21-9-1, have been to state just twice since 1965. “It’s pretty special,” Soderstrom said. “Not very many people get to do that. It’s been my dream my whole life to come here. Looking at those, and seeing how good they did, it’s kind of a booster to make you do better. 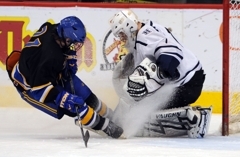 Riley Soderstrom scored twice and senior goaltender Josh Koop had a shutout in his first career postseason start as Thief River Falls earned the Class 1A third place trophy with a 3-0 victory over Hibbing/Chisholm on Saturday, March 12. This is the first trophy the Prowlers have won at the state tournament since 1959 when they took home the consolation championship over Minneapolis Henry. Hibbing/Chisholm senior goaltender Nathan Tromp made 27 saves for the Bluejackets who finish the season with a 18-11-2 record. 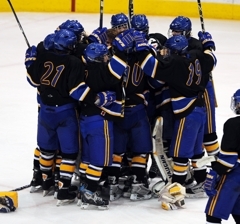 Thief River Falls ends the year with a 21-9-1 record. The junior forward scored two crucial goals in the second period. Soderstrom also won 11 faceoffs and sacrificed his body on a blocked shot for the Prowlers. 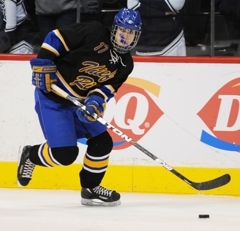 Making his first career postseason start at the Xcel Energy Center in the Class 1A third place game, Koop registered a shutout in the Prowlers' victory. 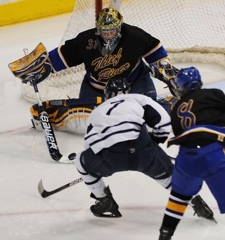 Seven of the senior goaltender's 17 saves came from Hibbing/Chisholm sophomore forward Adam Johnson who had four goals in the state tournament -- including a hat trick against Hermantown in the semifinals -- heading into the Saturday, March 12, matchup. 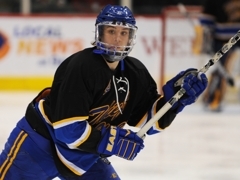 In his last game for the Prowlers, the senior co-captain and defenseman assisted on Soderstrom's second goal as well as making four shots on goal, blocking one shots and making two board-rattling hits. Audette was a presence on ice on each shift and also managed to stay out of the penalty box in a game that saw 34 penalty minutes.